Read the full article at boagworld’s web. It is not just the position of your call to action that matters. It is also the space around it. The more space around a call to action the more attention is drawn to it. Clutter up your call to action with surrounding content and it will be lost in the overall noise of the page. 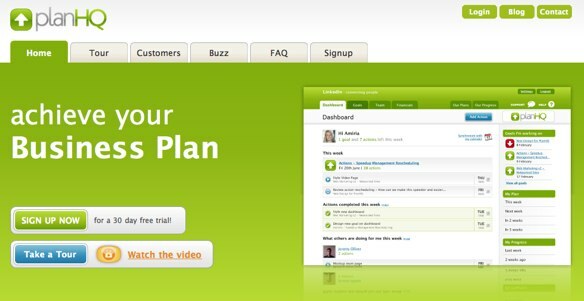 PlanHQ does an excellent job of focusing users of their calls to action by surrounding them with a lot of empty space. PlanHQ draws attention to their calls to action by surrounding them with empty space. Colour is an effective way of drawing attention to elements, especially if the rest of the site has a fairly limited palette. 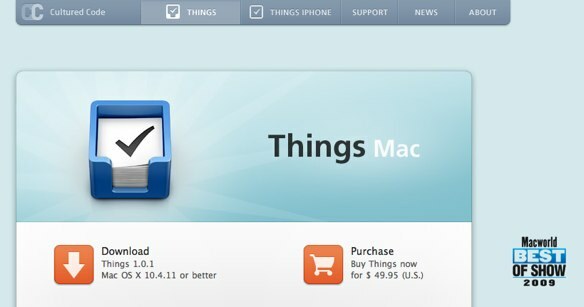 Things (the GTD application for the mac) does this expertly on their website. While the rest of their site is predominately muted blues and grey, their calls to action are highlighted orange. This extreme contrast leaves you in no doubt as to the next thing you should do. Of course never rely solely on colour because many users are colour blind and will not see the contrast. As web designers we often get annoyed with clients who ask us to make things bigger. It is certainly true that size isn’t everything. We have already established that position, colour and white space are equally important. However it cannot be denied that size does play a large part. The bigger your call to action, the more chance it will be noticed. Mozilla have certainly taken this approach to heart on the firefox homepage where their download link dominates the page. A call to action should not just be limited to the homepage. Every page of your site should have some form of call to action that leads the user on. If the user reaches a dead-end they will leave without responding to your call. Your call to action does not need to be the same for each page. Instead you can use smaller actions that lead the user towards your ultimate goal. 37 Signals understand the importance of having a call to action on each page. 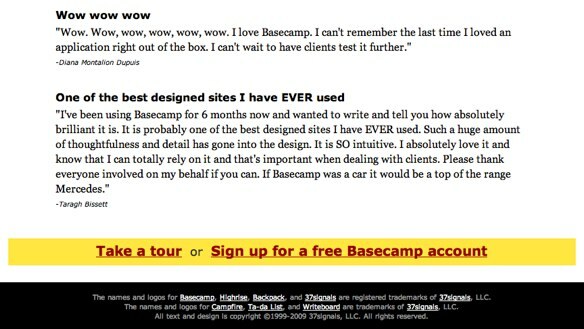 At the foot of every page of their Basecamp website they clearly display links to their tour and signup pages. Finally, consider what happens when a user does respond to your call to action. The rest of the process needs to be as carefully thought through as the call to action itself. One particular word of warning – if you require users to provide personal data about themselves, resist the temptation to collect unnecessary information. Marketing people in particular like to build up demographic information. Although I can appreciate the value of this, it brings a danger users will drop out of the process. WordPress.com is an excellent example of how to minimise the amount of data collected. They only ask for the minimal information required to setup a blog. 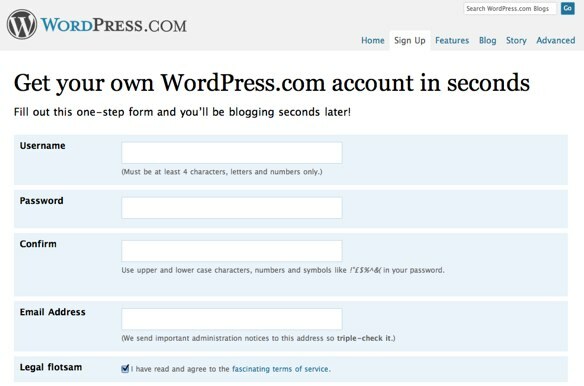 WordPress miminise the amount of information required to setup a blog. An effective call to action is the linchpin of a successful site and involves drawing together best practice in usability, creative visual design and powerful copy writing. However, if it is done right it can generate real measurable return on investment and in the current economic climate that is what we all want. Many thanks to Lee Munroe who found most of the examples I have used in this post. How to make them buy! Excellent, more like this please!